You know, I have to say that I really do appreciate the support I've gotten for Comic Book Fanthropology. If I'd have written it even just a few years ago, I'm sure I wouldn't have gotten nearly as warm a reception with it as I have. The December sales were about on par with what I expected, and I'd like to see if I can keep the momentum going a bit. 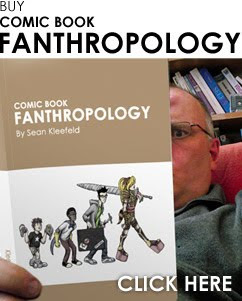 So here's the offer... if you enter in READMORE2010 as the codeword when you're checking out from buying my book, you'll get 10% off the cover price. The people who just see my ad won't have that privilege; I'm extending it just to you guys.